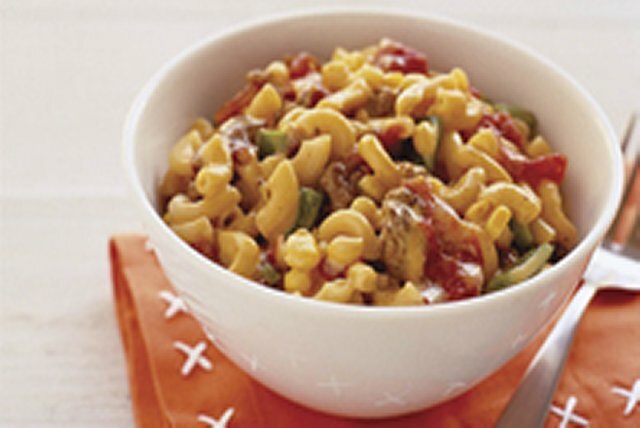 Turn a package of mac and cheese into a family-friendly dinner with the addition of ground beef, veggies and salsa. This might just become your new favourite recipe for mac and cheese! Prepare Dinner in large saucepan as directed on package, reducing the Pasta cooking time to 8 min. Meanwhile, brown meat with peppers in skillet; drain. Add meat mixture, corn and salsa to prepared Dinner; mix well. Cook 2 min. or until heated through, stirring occasionally. Stir in chopped fresh cilantro just before serving. Prepare as directed, using 1 pkg. (350 g) Kraft Deluxe Velveeta on Shells Pasta & Cheese or 1 pkg. (350 g) Kraft Deluxe White Cheddar on Rotini Pasta & Sauce.